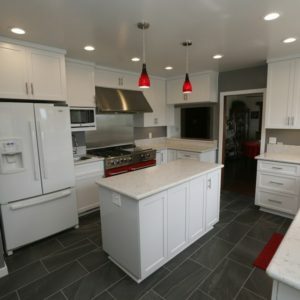 When undertaking a major project such as Kitchen remodeling in Rancho Santa Margarita CA, it’s really important to have the right contractor on the job. At Cabinet Magic, we believe we are that right contractor. At Cabinet Magic, we have over 30 years of experience in cabinet fabrication and remodeling. We know exactly how to get you the high quality products you need and manage all the moving pieces of the project so that the work gets done on time, on budget, and with superior quality craftsmanship. Whenever you do kitchen remodeling in Rancho Santa Margarita CA, you run into the challenge of making design decisions based off of product samples rather than the real thing. This can be problematic. For example, maybe your backsplash tile will suddenly look too busy when it covers a whole wall, or perhaps the new placement of your fridge will turn out less convenient than you’d hoped. At Cabinet Magic, we never want our clients to feel worried that they’ll be anything less than thrilled with their kitchen remodeling in Rancho Santa Margarita CA. That’s why we use computer rendering software to create detailed 3D images showing what the finished remodel will look like. You’ll be able to see and approve all aspects of the design down to the last detail before we begin work. Custom cabinetry can take your kitchen remodel to a whole new level. You’ll be able to maximize your storage space while also incorporating the features you want and the style you need to integrate seamlessly with your overall interior design. You can trust Cabinet Magic with your custom cabinetry because we have nearly 3 decades of experience in this specialty service. No decorative detail or cabinet accessory is too difficult for our talented craftsmen. Our cabinets are made to withstand daily use with ease and grace with features like soft-close hidden hinges and smooth drawer slides. Would you like more information about working with Cabinet Magic on your kitchen remodeling in Rancho Santa Margarita CA? Call us at 800-828-4380 or contact us online to schedule a free in home consultation. We can help you price the upgrades you want and give you a free estimate.